Click the Special Events by MGTR Tab! Maple Grove Tea Room is no longer in business. We appreciate your past support. We were forced closed by our landlord, The Province of Manitoba, Conservation and Water Steward Ship, who have made the decision to close Kennedy House to the public. The limited information that we have received is that there are structural and safety issues in regards to the building that require repairs. There is no set date to reopen Kennedy House Museum. Maple Grove Tea Room has enjoyed a very successful 12 years providing services in the St.Andrews area and we will remember many of our accomplishments for years to come. Maple Grove Tea Room IS PERMANENTLY CLOSED. Along with many wedding celebrations, family celebrations and many personalities that frequented the tea room on a regular basis. The success of a restaurant is knowing that clients were required to make reservations at the Tea Room a week to two in advance, or run the risk of not getting a table the date you were hoping for. That speaks volumes to our success. We have no further information than what we have indicated here on the page. 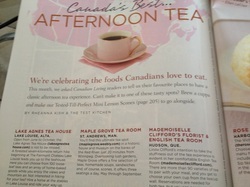 Thank you to all of our customers who submitted us, and to Canadian Living. Being a small business and to be included among greats like The Empress and Lake Louise is beyond humbling. Maple Grove Tea Room was opened in August, 2003 and operated for 12 seasons inside the Historical House know as Captain Kennedy House, in St. Andrews, Manitoba - by Valerie Brown. Each season we welcomed visitors and guests from all over Canada, USA and International locations. We enjoyed a great number of our clients who were return visitors. Some returned to lunch with us on every summer visit to the grand children or brought new friends to join them on their return visits to Winnipeg. Some guests were weekly visitors that we got to know by their voice on the phone as they called in for a reservation or those that arrived for lunch on a drive out of the city. The number of guests that dined inside the restaurant and on the patio per season was amazing. We leave Kennedy House knowing that our presence in the community made an impact on services that were provided. Our accomplishments were well documented and that makes us very proud as we reflect back. Thank you to each and every customer that graced us with their presence. We truly enjoyed our time spent with you.